Successfully Added Tevo Tarantula Prusa I3 3D Printer - Wide Filament Range, Large Building Size, Offline Print, High Precision, Dual-Color Print to your Shopping Cart. The Tevo Tarantula Prusa I3 is a cheap 3D printer that comes in the form of a DIY kit. With its simple to follow instructions, this 3D printer can be easily assembled by anybody out there. This allows you to fully get to know your 3D printer and to enjoy the achievement of building your own electronic gadget. Once fully assembled, this 3D printer kit features a compact and lightweight design. Thanks to this, it is perfect to be used in small offices, classrooms, or even at home. The 3D printer is easy to use and maintain, making it the perfect gizmo for all of you who are new to the unlimited world of 3D printing. With a printing volume of up to 200x280x200mm, this 3D printer lets you create decent sized products from scratch. Your gizmo supports a wide range of different filaments, making it great to work with for any type of artist. With its automatic platform leveling and height detection, you can be assured that you’ll be treated to a smoothly finished end product every time you use this gadget. With its dual extruders, it even allows you to print two different colors of filament. This will significantly increase your artistic capabilities while working with this affordable 3D printer. The Tevo Tarantula Prusa I3 3D printer supports high precision printing. With a printing speed of up to 150mms, it is able to create anything your mind can imagine at lightning speeds. Your gizmo even supports offline printing via TF card or USB stick. Thanks to this, you’ll be able to easily print your projects at any given moment. Whether you’re an artist, amateur hobbyist, teacher, or engineer – this cheap 3D printer is sure to meet your demands. 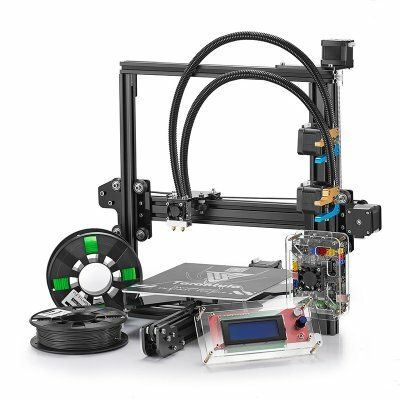 The Tevo Tarantula Prusa I3 3D Printer comes with a 12 months warranty, brought to you by the leader in electronic devices as well as wholesale electronic gadgets..